Disclosure: I received a free product for this review through Tomoson.com. 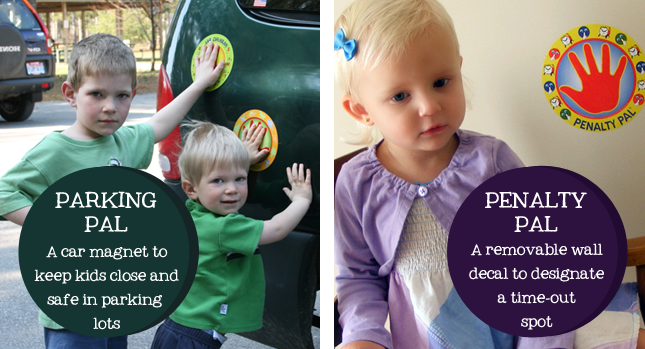 The Parking Pal is a car magnet that will entertain kids while keeping them safe at the same time! Children are automatically drawn to the unique, colorful, fun designs of the Parking Pal. Helping to reduce the possibility of parking lot injury, the Parking Pal is a simple, affordable solution to keep kids safe and right next to your car. Penalty Pal- Removable and easy to reposition wall decal used for time-out spots. emergency phone numbers. Great for kids who stay home alone or babysitters. For this review, I was sent a package that included 1 Penalty Pal, 1 Parking Pal, and an Emergency Phone List. My favorite of the three items is the Parking Pal. Although my kids are now old enough to know better, and to stay close to Mom in parking lots - I love the idea of using the Parking Pal to help keep young ones safer around vehicles. Many times I've had close calls with my kids, when trying to put groceries or kiddos into the car, while another one wanders around, and sometimes gets into the street or busy traffic of a parking lot. Having a Parking Pal magnet on the side of the car, would have helped keep them safer - a visual reminder that they need to keep their hands right on the car near Mom or Dad to stay safe. What a great way to teach kiddos to stay near Mom or Dad. Most young children learn visually, and having a place right on the car to put their little hand is the perfect way to show them that staying close to Mom and Dad is safe and can also be fun. I like the Penalty Pal sticker for home use. Often, when I send my kids to "Time Out" I just pick a corner for them to sit in where I can keep an eye on them while doing my house work. For the Penalty Pal - it is easy for even very young children to find their "Time Out" spot by placing the cute Penalty Pal sticker in one place where they always know to go. And though little ones (Like my 5 year old in this picture) are usually not very happy to be put in Time Out, they always know where to go with the Penalty Pal sticker - and I love that they are reusable. It is easy to peel them off (no damage to the wall) and re-apply them in another spot, or home. Penalty Pal and Parking Pal both make wonderful gifts for new parents or family/friends. Get a Parking Pal in a different color/style for each child - it comes in 8 different colors/styles! Get a different Penalty Pal for each floor of your home or for Grandparents' house, or for on the go - Penalty Pal comes in 4 different resusable colors.